I hope that you all have taken the opportunity over the last six weeks to eight weeks to fit in some rest & recreation, ready for what is already shaping up to be, another busy year. Early January, Camp Quality’s regional, annual summer camp, this year held in Awakeri, was again assisted by a significant number of volunteers. Mike has already circulated a report. I would like to add my thanks to the brethren and Ladies who assisted. Saturday 5th August Lodge Whakatane No 198 saw Bro Wayne Marriott installed into the chair of King Solomon, with all due Ceremony. W Bro Marriott will certainly bring some fresh ideas with him in his new role. The following Tuesday, 8th August, W Bro Geoff Mather was again installed into the Chair in Lodge Rotorua No 153. W Bro Mather has done a couple of terms as Master, and Lodge Rotorua is fortunate to have such a willing Past Master to fill this role again. On Saturday 19th August Lodge Kaimanawa No 426 installed Bro. Ian Hendl into the Chair of King Solomon. Another new master in our district to bring along some fresh thinking and two candidates ready to start on the pathway of freemasonry. Saturday 26th August brought the Grand Master M W Bro Mark Winger to Lodge Te Puke to present W Bro Bruce Stephens P G Std. B with his 60 year service bar. Congratulation Bruce once again. 4th September saw a good attendance at Lodge Kawerau to hear W Bro Bill Tripp talk about his experiences as a long service staff member of Trans rail. W Bro Bill particularly discussed the utter idiots that do not stop when required at rail crossings, do not see locomotives etc. A wide range of questions followed this interesting presentation. September 12th saw a large contingent of Brethren assemble as guests of Lodge Rotorua 153 to listen to a presentation on education, where its going, history, and as part of a lively discussion got the brethren thinking about the subject, what is appropriate, interesting and what may be required. The Gate Pa Lodge held their installation on the 27th September, installing V W Bro Noel Whiley into the Chair of King Solomon. With W Bro Whiley’s broad experience in many civilian roles, and in freemasonry, The Gate Pa Lodge is all set for another good year. Winter ailments and health issues seem to have surfaced with a vengeance this past month, I trust you all will look out for each other. Only one installation this past month, that being W Bro Doug McNab of Lodge Arawa # 406. V W Bro Tom Becker enjoyed the opportunity to conduct the installation, which was enjoyed by all who attended. Welcome Doug and your team. The Grand Master M W Bro Mark Winger has accepted an invitation from Lodge Te Puke, and will visit on Saturday 26th Aug. Keep a look out for details. I look forward to catching up with you at these important events. The district meeting organised for 25th August has been postponed, due to a clash with the Grand Masters visit to Te Puke. A replacement date for this meeting will be advised in due course. The digitisation of photo’s project, initiated after the flooding in the Eastern bay has been promoted and has proved so successful the BOP Acacia Trust is in the process of trying to extend the programme. Over 10000 images will have been digitised when the project ends on 31st July. A back log of more than 10000 images still exists and with the publicity generated ongoing enquires are still being received, hence the need to try and have the project extended. It seems to be quite some time since I last posted and so much has been happening I hardly know where to start. So very briefly, 10th May W Bro Don Scadden was installed as master of Mt Maunganui by V W Bro Jack Price. On 13th June V W Bro Doug Lowry was installed as master of The Katikati lodge by Rt W Bro Derek Meredith. W Bro Kevin Carroll was again installed as master of the Coromandel Lodge on 17th June. Thanks guys for taking on these jobs for your lodge once again and I am sure that you all will make the most of year in office. Thanks also to those who attended our meeting in Kawerau on the 9th June where we discussed the plan for the district, and the members of that lodge who made us most welcome. The next day I attended a divisional meeting in Auckland. Wednesday the 21st lodge Kaimanawa hosted an official visit by the Grand Lodge officers, this was a third degree working and was also a little different, as the meeting was held in Rotorua by dispensation so that the full effect of this degree could be experienced by all concerned. A fantastic evening was had by all. In the wake of the extensive flooding experienced in the eastern bay, The Digitisation and Scanning Project, sponsored by BOP Acacia Trust in conjunction with Heritage Studios has been accepted and fully funded by the NZ Lottery Grants Board. The first day of scanning will be 29th June until 3rd July at St David’s church hall in Edgecumbe. This will be followed by a second week of scanning shortly with place and dates yet to be advised. The high quality, memory sticks supplied to the participants free of charge will be branded with the square & compasses. This is a fantastic exercise in preserving historical or treasured photographs for the individual and community at large. It is also a fantastic opportunity in speaking up for freemasonry. For more details of this project talk to either myself or Wayne Marriott. I would like to hear more, about what your lodge is proposing in speaking up for Freemasonry, so that others may gain by your experience. V W Bro Ivan Smith PGC has been installed as Master of the districts oldest Lodge, being Lodge Waihi No 112. It was fantastic to have such a good turn out in support of Ivan and I believe a good night was had by all judging from the feedback I received. Coming up on Wednesday 10th Mt Maunganui installation, with W Bro Don Scadden master elect to be installed. The installing master will be V W Bro Jack Price and I trust we will get another good turn out in support of this lodge and Don. 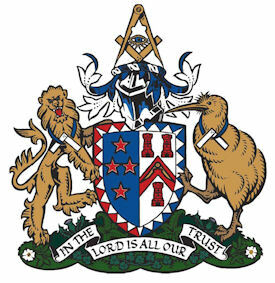 Friday 9th June: Masters, intending masters, and those forward-thinking brethren, with an interest in the development of the district and their lodges are invited to attend a meeting in Kawerau at 7.00pm. The district development team will outline their findings and thoughts moving forward in relation to the district plan. It is intended to be an interactive meeting, with positive outcomes or strategies moving forward. The only requirement is to bring a positive mind. The northern division website is now operational and can be accessed through the websites mentioned above. At this point the site has experienced over 3000 hits, so a good number of you are already familiar with the site. As always, these sites are useless if they are not used. It is incumbent on us all, to make the most of what has been provided, the website will become increasingly important as the communication tool moving forward, whether we like it or not. On 27-4-2017 we certainly had a good turn out in Te Puke for W Bro Fred Read's installation, I am sure that Fred appreciated your effort in attending as did I. Thanks to all. This month we have two installations, Lodge Waihi #112 Monday 1-5-17 V W Bro Ivan Smith and Mt Maunganui # 376 Wednesday 10-5-17 W Bro Don Scadden. Please pencil in your calendar, Friday 9th June meeting, for lodge masters, intending incoming masters and those brethren interested in progressing the future of the district and your lodge. Where, Lodge Kawerau @ 7.00 pm Fri 9th June. What an enjoyable evening we had at Lodge Kaimanawa’s annual Empty Chair Ceremony on the 26 April 2017 at the Taupo Museum, Story Place. This short ceremony is to honour the sacrifices made by New Zealand soldiers in fighting oppression and keeping the peace in conflicts around the world. 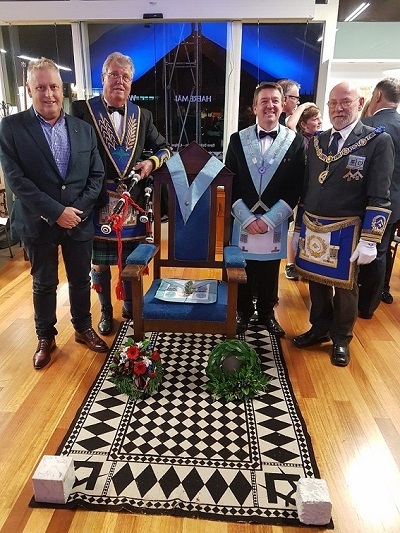 This ceremony is not restricted to masonic brethren only and a number of the public enjoyed this experience along with, his worship the mayor, David Trewavas Taupo District Council. The Eastern Bay has been hit pretty hard with flooding over recent days. You are all undoubtedly aware of the devastating damage caused in Edgecumbe. This has dominated in the media and is extremely serious. However this has overshadowed a number of other areas also severely affected. This damage now combined with another weather front approaching will cause even more stress and damage. I have had discussions with the Grand Almoner, the Divisional Grand Almoner and Tom Becker District Charity Officer. Emergency funding is available to those in need, as always those requiring this assistance need to be identified. Should you encounter a resident requiring this assistance please communicate details to either, Tom or myself. Please use the proper channels and, please do not make promises. In the longer term assistance will also be available with local lodges leading, supported by the district and nationally. W Bro Mark Kerins installed as master of Lodge Te Papa 316, we were honoured to have our Divisional Grand Master in attendance for Marks installation and our only full installation ceremony so far this year. W Bro Brian Purvis P G Std B has again taken on the masters role for Kawerau 422. Notice of district 7 meeting to be held in Tauranga at Hairini Friday 17 Feb 2017 @ 7.30 start, cuppa prior if in time. Let me know if you have any item for inclusion on the agenda. Open to all. I wish you all the very best for the festive season, stay safe be it on the land, sea or in the air, may you have an enjoyable Christmas and a happy New Year. We have now had the Grand Installation in Wellington and MW Bro Mark Winger has been installed as our new Grand Master. During the conference MW Bro Winger spoke of his intentions for the craft encompassing the next few years. Briefly covered they are centred around, communication, membership and financial stability. The major initiative being titled; “speak up for freemasonry” the initial challenge associated with this campaign is; each and every brother is challenged to speak to someone who is not a freemason once a week about freemasonry. This simple task equates to 52 people who are not freemasons be they man or woman, being more informed about freemasonry by the end of a twelve-month period. Now multiply that by every member of your lodge. We as an organisation and more particularly your lodge, should see some real positive spin off if this simple initiative is acted upon. The new active Grand lodge team for the Bay of Plenty consists of myself, W Bro Glen Harris as Grand Director of Ceremonies, W Bros Ivan Perry and David Johnstone as Grand Stewards. W Bro Bruce F Scott has been appointed to the position of Grand Sword Bearer and W Bro Colin Wilde has been honoured with the rank of Past Grand Sword Bearer. I congratulate these brethren and sincerely wish them well, in their new positions. We also have two distinguished brothers from the Bay of Plenty receiving recognition in the form of, Roll of Honour. This honour is not bestowed lightly and W Bro Malcolm Kidd and W Bro John Lewis are deserving recipients. Presentation to these well deserving brothers will be made when suitable arrangements are able to be put in place. Initially attempts were made to have these presentations in combination with the investitures of the Grand Offices unable to be invested at Grand Installation. Unfortunately circumstances prevented this from happening.